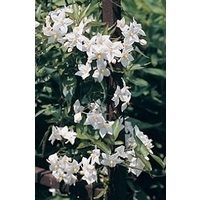 Create a stunning effect with the fantastic climbing or creeping Solanum plant. This is a very easy to manage plant and can be trained up against a structure or similar to give an abundance of colour and coverage. Solanum can also be used as an effective screening plant for oil tanks and such like when planted against a trellis in front of the object. See photos of Solanum jasminoides in real gardens.